Born 1939 in Malaysia, graduated from the Nanyang Academy of Fine Arts, Singapore in 1961. Khoo Sue Hoe landscape paintings reveal relationship of man and nature. Man-made structures like poles, windows, curtains and gateways against backdrop of God-made nature like sky, sea, river, hills and mountains always become the main elements in his painting. Evocative figures in strange postures and surreal landscapes come together on large canvases, echoing the artist’s subconscious as a man of two worlds, a Southeast Asian and global citizen. 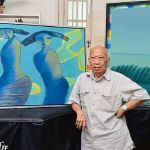 Khoo’s works are collected by public institutions like National Art Gallery Malaysia, National Gallery Singapore , SGM and important private art collectors.